When I went through nutrition coaching for managing the onset of Parkinsons Disease, one of the most important factors reiterated time after time was making choices that have the optimal benefit. One simple replacement in my diet was beneficial greens. In the grocery store, conventional growers ship (relatively nutritionless) iceberg lettuce because of its firmness and ability to last much longer than leafier, more powerfully charged greens. Even though I do not get very excited about the spicy palate, choosing greens high in protein and anti-oxidants meant getting to know the greens that are quite peppery. Arugula and mesclun mix are now my co-conspirators for creating exciting salads and giving myself a break when soaking on honey and poppy seed dressing. The balance of the sugars with the power packed greens burn the fat, give me energy and boost my mood almost instantly. 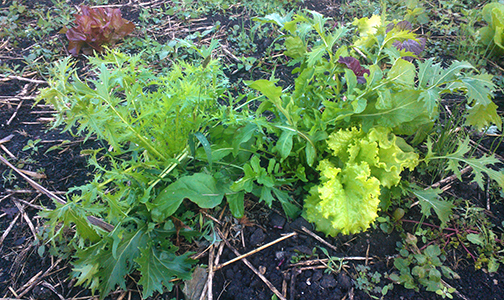 This week’s box includes a mix of spicy greens from Dirt and Duty Community Market Garden!